Makati/ Big Difference PR- Philippine Ducati Weekend is based on the popular World Ducati Week, which is held at the Misano World Circuit in Italy. The Philippine Ducati Weekend was first launched at Clark International Speedway, Philippines, in 2012. From the first Philippine Ducati Weekend, it had achieved an outstanding level of success from the attendance because of its variety of events, activities and full immersion of pure Ducati Lifestyle. This event only happens every two years. Hundreds of people are expected to witness this once in a lifetime “2-wheel” spectacular in the Philippines. Highlights of the Event will include a Ducati Diavel Drag Race, Motokhana, track-day for both Ducati owners and non-Ducati owners, Dunk Tank for a cause, Bikini Bike Wash and the much awaited viewing of the Ducati Scrambler. Superbike champion Carlos Checa will also be gracing the event. Aside from that, there would also be concessionaires for motoring, food, drink and games. The great thing is that there are different packages to choose from that will suit one’s preferred activities. The Philippine Ducati Weekend is an event open to all, motorcycle enthusiasts and non-motorcycle enthusiasts alike. 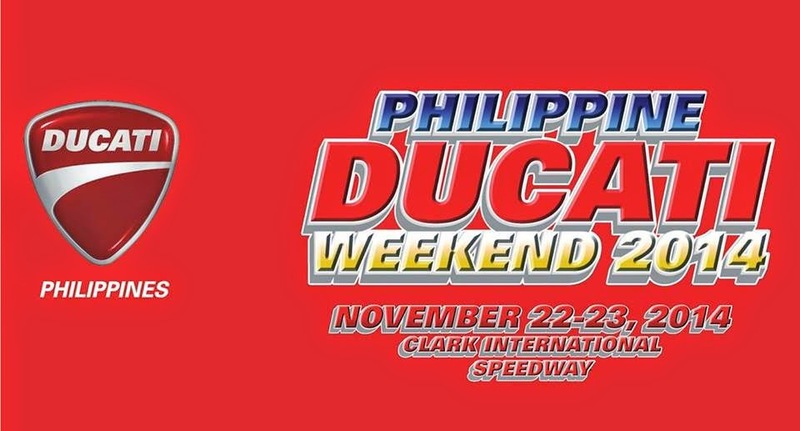 Save the date, see you all at Clark International Speedway on November 22-23, 2014, and let’s all be a part of this historical Ducati event in the Philippines! For tickets, you may contact 09178691790 or you may visit Ducati dealership stores (Ducati Manila, Ducati Alabang, Ducati Bacolod & Ducati Davao). WE ARE GOING TO BE THERE. ARE YOU?